02 Jan Which of Truro’s 79 restaurants shall we eat at? A friend called tonight, en route from Halifax to Cape Breton, wondering if I could recommend a restaurant in Truro where he and his partner could eat supper. 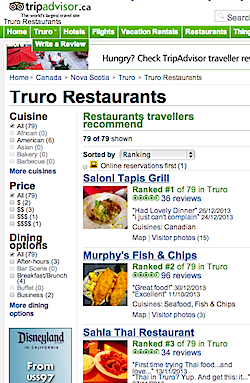 A quick Google search turned up TripAdvisor.ca‘s listing of 79 Truro eateries. That’s right: 79 restaurants in Truro, one for every 159 residents. Moreover, 60 of the 79 had user reviews. Those that did not were mostly predictable chain outlets like McDonald’s, Tim Horton’s, and Subway. In seconds, I was able to call up the dozen or so with the highest user rankings, eliminate those whose cuisine did not interest my friends, click through to the most promising restaurants’ own websites, and read some dinner menus to my friends over the phone. They settled on Bistro 22. * The whole process took less than five minutes. OK, before this becomes so commonplace we don’t even notice it, can we just say the internet is an amazing tool? * No offence to any of the others. It’s just what my friends felt like.